Dr. Dolittle is a people doctor who's love for animals and giving them a home, scares all his human patients away. Dr. Dolittle's parrot decides to teach him how to talk to animals, after learning the secret language, Dr. Dolittle becomes a veterinarian. Poor Dr. Dolittle always has money problems, but when he learns of a monkey epidemic in Africa, he has to help. In gratitude, Dr. Dolittle is given a rare creature who is part unicorn. But, on the way home, pirates!!!! Does Dr. Dolittle make it home safely? What happens to his animal friends? This classic story will hold you spellbound to the end. 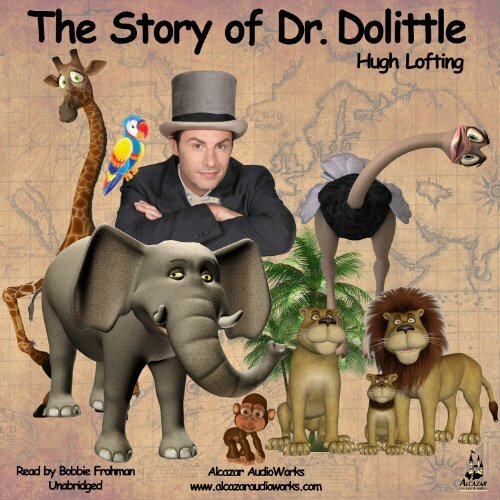 Hugh Lofting (1886–1947) was an English novelist and poet, most famous for "The Story of Dr. Dolittle". A civil engineer by training, Lofting created the story of the doctor who could talk to animals, while writing letters to his children, when serving in the military during WWI. Wonderful story, great summer read! I would recommend this particular narrator's version for younger children. I had another narrator's version but that person spoke with a British accent and my children were unable to decipher the accent. My kids loved Dr. Dolittle and the Push-me-pull-you. They liked the doctor because he was nice and saved animals. They loved the Push-me-pull-you because it tickled their funny-bone. Yes, it is easily devoured in an afternoon but my children have short attention spans to it took us 2 weeks of off and on reading of 2-3 chapters a day to finish.